The following guide to treating Ich in a freshwater aquarium is a collection from various fish forums and experts. As someone who has dealt with Ich before, I can attest to the accuracy of the following treatment method for ridding your freshwater aquarium of Ich entirely. Ich (Ichthyophthirius multifiliis), or White Spot, is a protozoan parasite that exists free floating in aquarium water. It can affect most aquarium fish but is most commonly found infecting small-scaled fish such as loaches. The first signs of an Ich infestation may be rapid breathing, redness around the gill area, clamped fins, loss of appetite and lethargic or reclusive behavior; but the most common sign is the appearance of tiny white spots on the skin of the fish that resemble grains of salt. Infected fish may also begin flashing by continuously rubbing themselves against rocks, gravel or aquarium decorations. The white spots on an infected fish are visible during the trophont phase of the cycle. The spots are actually scarring that occurs as the parasite burrows under the fish’s skin. Beneath each white spot, the Ich is forming a tiny cyst in which it multiplies by cellular division. At this stage of the infection, the Ich is impervious to medication. When the cysts mature, they burst and release thousands of the tomont-stage cells into the water. The tomonts develop a slimy coat immediately after emerging from the infected fish, which allows each one to adhere to aquarium décor, substrate and even the glass walls of the tank. Once the encapsulation is complete, the organism begins a second stage of reproduction by further cellular division. Finally, the Ich is released from the capsules in its theront phase. These microscopic theronts swim out in search of new host fishes and begin the cycle again. It is only during this free-swimming phase of the life cycle that medication is effective. 1. Perform a 50% water change by vacuuming the substrate well. This will eliminate a large portion of the Ich cells in the tank immediately. 2. Remove any carbon from your filtration system. Carbon depletes the active chemicals in Ich medication from the water. Throw this carbon away as it may harbor more Ich cells. 3. Gradually increase the water temperature to 30°C (86°F). Warmer water speeds up the life-cycle of Ich. Note that exceeding this maximum temperature for too long can, however, further stress or even kill many fish. Also consider the temperature requirements of any live plants and other fish you may have in your tank when treating Ich. 4. Dose your tank with Ich medication (best are ones that contain the chemicals formalin and malachite). Follow the instructions carefully on your Ich medication of choice to ensure you don’t overdose. 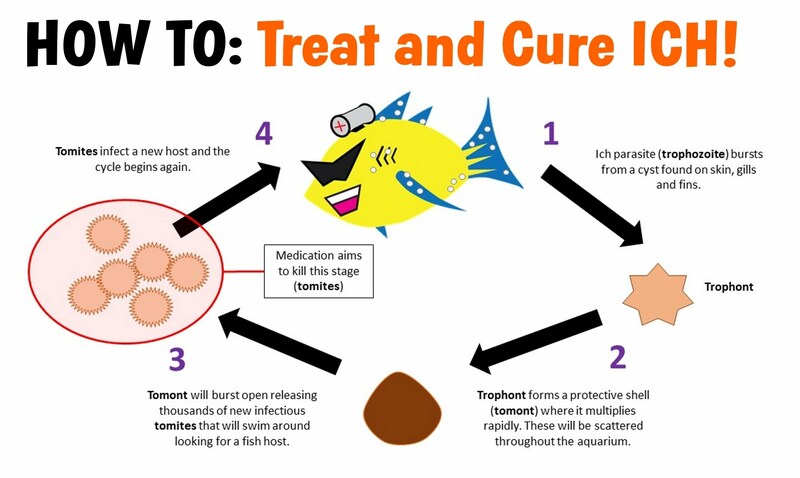 Some argue that one should only use half the instructed amount for small-scaled or scaleless fish, but most new Ich meds on the market are safe for all fish. 5. Try to increase aeration by either lowering the water level to allow a splash from the return flow of your filtration, by turning up the power on your air pump, or by cleaning or using a new air-stone. Gill function of infected fish is usually compromised by the Ich parasite and they will benefit from an increased oxygen supply. 6. Wait a minimum of two days before dosing the tank again. Some aquarists have had success waiting four days between treatments. Remember – when treating Ich you want to expose the maximum amount of theront cells to the medication for the longest possible period of time. 7. Perform another 50% water change and then dose the tank again. Repeat this cycle of large water changes followed by medication (with 2-4 day intervals) at least four times to ensure you rid your tank of Ich entirely. Just because there are no more spots on your fish, doesn’t mean that that Ich is not still alive in the water in the invisible theront stage. Remember to wash thoroughly after coming in contact with treated water. 8. Once the full course of medication has taken place, slowly begin lowering the water temperature back to normal, and place fresh carbon in the filtration system. Note: It is essential to continue treatment for at least three days after the last visible sign of Ich is gone. Some waterborne cells may still be alive in the tank. A good, general tip is to feed your a fish the most varied diet as possible during any medication phase, as this will give them the best fighting chance against any infections. A final tip is to never add the water from a fish store into your tank. Once you have acclimatized new fish by gradually pouring tank water into the plastic bag, you should pour this water out over a net before adding the new fish. The treatment method above has been tried and tested and will minimize stress on fish in most situations. Once the tank has been cleared of Ich, your attention should shift to water quality and rebuilding a healthy and mature bio filtration cycle and a comfortable home for your fish.